No one enjoys a sunburn! Some breeds are more susceptible to burns than others. If your dog is short haired and light colored (white or fawn especially!) beware of sunburn potential! Even if your dog’s breed is not listed above, they could still be at risk of sunburn! All dogs have the potential to burn in the summer sun, so be sure to frequently check areas prone to burns such as the snout, the tips of the ears, and the belly. 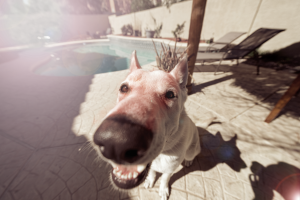 If your dog loves to sunbathe, it never hurts to use a little sunscreen! Although dogs should never use human sunscreen, there are plenty of pet safe options. Sunburn isn’t the only skin related issue pets can experience in the summer. Paw pads are at risk of damage due to hot pavement. We frequently saturate the ground around our dog pool to keep our swimmer’s paws cool, but that isn’t an option when walking in the city! Before you take your dog for a walk, press your hand to the cement for 10-15 seconds. If it burns, reconsider letting your dog walk continuously on pavement. When possible, encourage your dog to walk on grass and keep their paws off the hot sidewalk. If that isn’t possible, you may consider using a paw salve like Musher’s or PAWZ to protect your pooch’s paws. Rubber boots are also an option for paw protection. Even when the pavement isn’t hot enough to burn, continued exposure to the warm surface can cause damage over time. You may begin to notice your dog’s paw pads becoming rough, dry, or cracking. If this happens, don’t worry! There are plenty of products ranging from soothing balms to paw spa treatments which can aid in healing cracked or rough pads. If you don’t have time to treat your dog’s paw pads, our grooming salon offers a “pawdicure” which includes a soothing soak treatment, soothing paw balm, and a nail file if your pup’s paws are in need of a little TLC. Even though our swimmer’s keep cool in our in-ground dog pool, we still train our staff to be on high alert for symptoms of heat stroke. Heat stroke is a serious concern during the summer months. What may start off as a little extra panting, can quickly become much worse if the proper precautions aren’t taken. It is vital to your dog’s safety that you are aware of the symptoms of heat stroke! If your dog displays any of the above symptoms, please seek emergency care right away! You can help slow the symptoms of heat stroke by pouring cool or tepid water (never ice cold!) over your dog, pour water on their paws pads, fanning them off, and most importantly: getting them out of the sun. Luckily for us, the symptoms of heat stroke are easy to spot once you know what to look for and don’t typically become rapidly severe. If your dog becomes less responsive during play, lethargic, or appears to have a “mental fog” accompanied with a lot of panting, chances are you should get them out of the sun for awhile and be certain they have access to fresh water. Our staff prides themselves in practicing sun safety during our swimming groups, and we’re glad to pass any information along that we can to keep your dog safe whether they’re swimming in our dog pool or hanging out in a Chicago park. If you have any questions about sun safety, please don’t hesitate to reach out during your next visit!